It was only a brief smile, a smirk even. It passed across Vicente Del Bosque’s rumpled features as Chile scored the second goal of their stunningly straightforward 2-0 win against his Spanish team, a fleeting glimpse of the emotions raging beneath the coach’s normally stoic visage. In that moment, his thoughts — or at least some of them — could be discerned. Everything must end. Spain coach’s Vicente Del Bosque saw his world champions bow out before the group stage is concluded. The avuncular Del Bosque is a vastly experienced operator who has seen it all and won just as much: La Liga titles, two Champions League finals, a European Championship, the World Cup. He inherited a fine unit from the late Luis Aragonés then refined it, tweaked the components, imbued it with the collegiate spirit so often absent from the world’s more gilded national set-ups and, from 2008 until Wednesday night, Spain, La Furia Roja, exerted an unprecedented grip on the international game. While the forthright Aragonés and passive Del Bosque were vastly different men, fire and ice, to employ a facile distinction, they succeeded in bottling something very special. If he had watched the crumbling of the empire he forged, Aragonés himself would probably offer up a smirk. Nothing lasts forever. 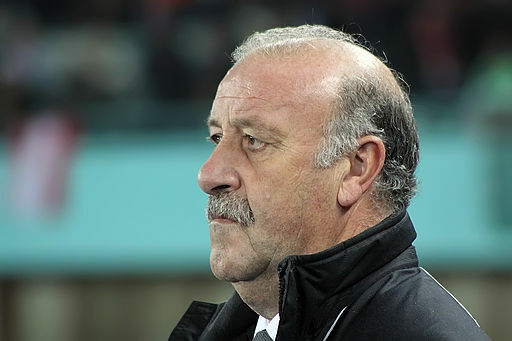 That a side of rarefied accomplishments might suffer a demise is not unthinkable in the minds of gritty football men like Del Bosque. Yet, having been blessed with an ostensibly strong hand at the opening of Brazil 2014, the implosion of the omnipotent Iberians’ situation, from a championship defence to an early departure, is nothing short of spectacular. Harnessed by Aragonés and honed by Del Bosque, Spain’s ‘tiki-taka’ — removed from its Lionel Messi-infused equivalent at Barcelona — laid waste to all challengers. That loaded moniker evolved, admittedly, into a pejorative long ago, carrying with it a criticism of the archly smothering discipline inherent to this focused philosophy. Proponents of cut-and-thrust populism eschew the approach but it is, nevertheless, difficult to deny the effectiveness of such singular ideals. In a sport as spontaneous as football, this precise, high-pressing, tactically-restrained strategy was as close to perfect as anything previously witnessed. Grim adherence to a particular plan is all very well and, in the decades before its recent enlightenment, Germany’s considerable successes were built upon cold pragmatism. On the other hand, the transformative qualities of the awe-inspiring Spanish dedication to one outlook undermined accepted truths. It created a new reality where possession was not just important, it was everything; it was stifling defence, it was devastating attack. This was the weapon itself, the means by which to tire the opposition, any opposition, and eventually, inevitably, defeat it. 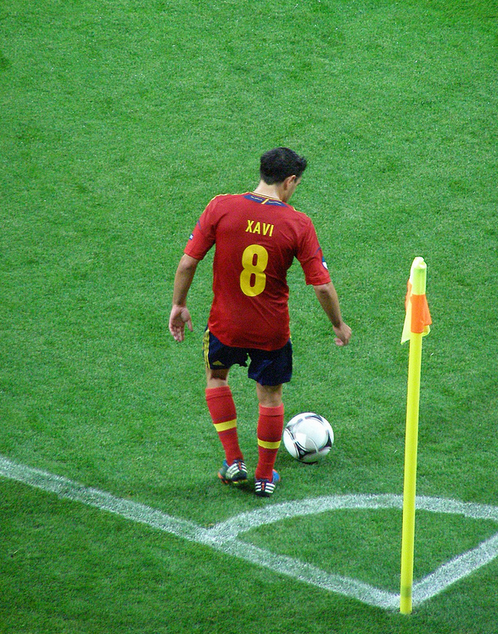 Midfielder Xavi’s era as the heartbeat of the Spanish team is surely at an end. Three successive major competitions were marked, and won, by the draining beauty of Spain’s soft-shoed panache, attritional warfare as a sporting contest. Waves of red-shirted midfield conjurers retuned the game’s otherwise cacophonous symphony: Xavi as the conducting genius, Andrés Iniesta his star soloist, David Silva, Xabi Alonso and Sergio Busquets the elite-level supporting virtuosos. That they should secure berths in the first XI at the expense of understudies like Cesc Fabregas, Juan Mata and Santi Cazorla merely underlines the eye-watering brilliance at the core of this side’s consistent dominance. For Spain, the shuddering immediacy of present failures, the vulgar ruination of a winning tradition, is wholly numbing and difficult to process. The seven goals conceded so carelessly over the course of 180 minutes will rankle for some time. In fact, prior to their initial humiliation by the Netherlands, Xavi and his captain, Iker Casillas, were speaking seriously of going the distance once again, a prediction few discounted as fanciful. The current malaise is, of course, far from unprecedented. In 1986 and 2010, for example, Italy bombed as world champions. The French, too, plagued by hype and a hobbled Zinedine Zidane, disgraced themselves in 2002, scoring not a single goal during a spectacularly prolonged pitch-based collapse at the Japan and South Korea World Cup. Their glorious Euro 2000 campaign was all but forgotten, the 1998 triumph in Paris a distant memory. 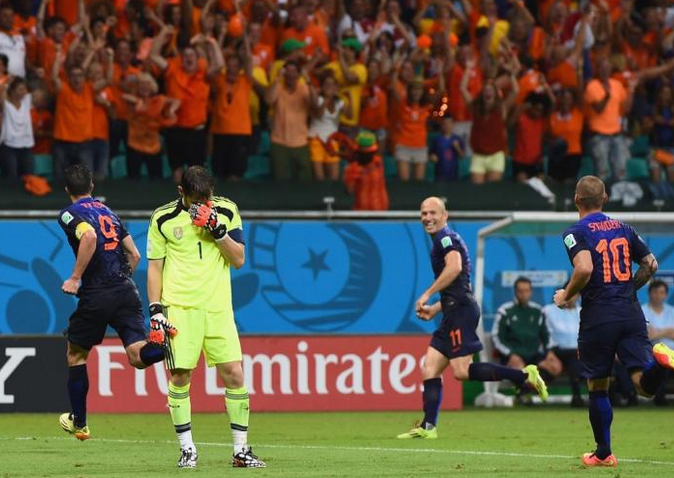 There are important distinctions between such obvious calamities and Spain’s exit in Brazil. Italy are perennial contenders with the potential to succeed in the right circumstances and France, blessed with an astonishing array of talent alongside Zidane, rightly benefited in 1998 — and in 2000 — from their own momentum. That being said, neither nation could be credited as revolutionising the very notion of how this sport is played. In short, it is no overstatement to suggest that the glorious Spanish framework was epoch-defining. As World Cup and European Championship titles were built on startling degrees of ball retention, the 45% of possession enjoyed by Chile is a clear and sobering reminder of faults in the system. In truth, the South Americans were dazzling, a blur of perpetual forward motion, football expounded with joyful wild abandon. Robbed of the opportunity to completely control the pace, Spain, rife with jarring defensive frailties and never reaching beyond a ponderous tempo, were exposed to rampant opponents in ruthless pursuit of a symbolic victory against the old imperial masters. Indeed, as this most thrilling of group stages plays out beneath the azure skies of what was once the New World, there is no small sense of European staidness giving way to the bewitching unpredictability of an exotic colonial outpost. Compared with Spain’s stately manner, Chilean vibrancy encapsulates that shimmering impermanence of concentrated tournament football. It has been breathtaking to behold thus far. To pronounce tiki-taka dead would be premature in the extreme, a surrender to those churlish critics who level charges of boredom at its quiet refinement. Regardless of recent events, Spain remain a high-end, A-list collective. The signs of breakdown, however, are not so subtle as to seem invisible. Most pertinent is the fact that many of Spain’s personnel were involved in arduous seasons as Real Madrid, Barcelona and Atlético Madrid battled it out to the death on dual fronts, the Catalans’ uneven performances serving as ill omens given the close stylistic ties between club and country. Non-stop, far-flung fixtures have exhausted the national team further and the brutal defeat to the Brazilian hosts in last year’s Confederations Cup final appears more than an irritating anomaly. Andrés Iniesta is now, arguably, Spain’s most crucial player and its principal creator. Xavi is likely a spent force at this level. His tenure as the system’s truest disciple, its zealous metronome may endure in the cosseted environs of the Camp Nou (or Qatar) yet, away from that, at 34, his time is up. Iniesta, four years younger, still retains enough of that famous magical ability to stay relevant but his role is ever one of free-form interpreter, an incisive and reactive presence at Xavi’s hip. Whether or not anyone else in the stable of lusciously gifted midfielders — and it is in the middle that this team’s fortunes are born — can hew as closely to the pure spirit of tiki-taka is less than certain. Nor should it be considered a foregone conclusion that these sensibilities are still entrusted outright to deliver results. Other associated questions persist. Diego Costa is undoubtedly a forward of outstanding ability and, in the continued absence of the Fernando Torres of old, he is the best alternative to an ageing David Villa. Where his rugged skills fit into a transitioning group should be as fascinating as Koke’s possible elevation to Xavi’s open spot. Casillas must be reassessed also in light of his unlikely casting as the weak link. A world-class performer at his peak, the residue of his disastrous power struggle with Jose Mourinho has meant a loss of sharpness as Real’s lesser-used goalkeeper. In the back line, Gerard Piqué and Sergio Ramos, two of Europe’s most garlanded professionals, have been picked apart to an alarming degree in the last week, their arrogant certainty departing with Carles Puyol and his 100 caps. At 27 and 28 respectively, however, they will surely continue as the preferred central partnership for the Euros. Once an automatic starter, and one of the world’s finest goalkeepers, Iker Casillas, wearing 1, has been the weak link for Spain at Brazil 2014. For that is where Spain next take their chastened roadshow. The generation now assuming responsibility for national pride is far from underwhelming and a random sampling of its players — Fabregas, Mata, Koke, Isco — is enough to engender covetousness in any international manager. A renewed shot of youthful brio will not be unwelcome two years hence. Qualification is a near certainty and with deep wounds in need of salving, the chance to protect their European title assumes a new significance. Their hunger, sated perhaps in the tropical heat, cannot be less than voracious in the cooler climes of France 2016. The prevailing quandary is one of tactics, not people: stick or twist?